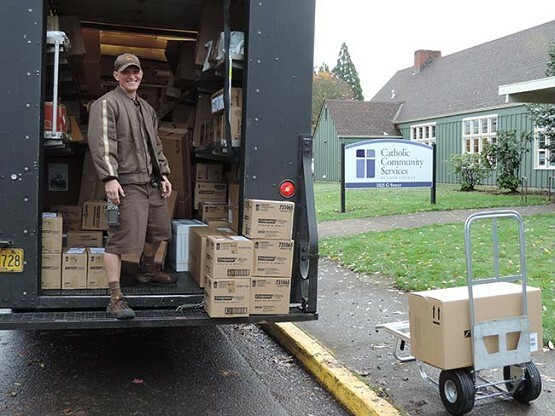 UPS driver delivers boxes of toothbrushes to Catholic Community Services of Lane County. EUGENE — Catholic Community Services of Lane County has received a donation of 14,400 toothbrushes, thanks to Colgate and a Eugene dentist. Half of the donation, 121 boxes of toothbrushes & toothpaste, were delivered today to the Springfield Community Service Center. A Colgate representative worked with the local dentist — who wants to remain anonymous. More than 20,000 people come to the two Catholic Community Services centers yearly for help with food, clothing, energy assistance and housing. All donations of hygiene and clothing items are given away free. “Toothbrushes are one of the items that we often run short of and it’s certainly going to give us some peace of mind to know that we are covered in that area for many months to come,” said Chris Pickering, manager of the Eugene Community Service Center. Toothbrushes also will also be distributed by case workers conducting home visits throughout Lane County.